Brett Moffitt has two wins in the first 11 races of the 2018 NASCAR Camping World Truck Series season, but after he claimed his second win at Iowa Speedway in Newton on June 16, Moffitt wasn’t sure he’d make the postseason playoffs. To make the playoffs Moffitt would need to compete in all races in the regular season, but his No. 16 Hattori Racing Enterprises team was unsure of its future beyond the next race on the schedule, the June 23 race at Gateway Motorsports Park in Madison, Ill., because of a lack of funding. The team announced on Wednesday, though, that it would, indeed, be at Chicagoland Speedway in Joliet, Ill., for Friday night’s Truck Series race there, courtesy of sponsorship from Fr8Auctions and Northland Foundations Inc.Fr8Auctions supported Moffitt’s efforts in the 2015 NASCAR Cup Series season-finale at Homestead-Miami Speedway. Soon after that race, he was named the 2015 NASCAR Cup Series Rookie of the Year. Moffitt is third in the Truck Series driver points standings heading into the Chicagoland race. 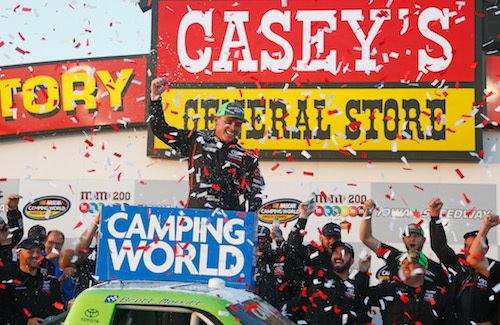 His two wins, the first coming in the second race of the season at Atlanta Motor Speedway in February, make him one of only two multi-race winners, so far, this season with the other being four-time winner Johnny Sauter. Including his two wins, Moffitt has five top-five finishes in the first 10 races of the year. His Atlanta win was the first for Hattori Racing. The No. 16 team has plans secured for the July 12 race at Kentucky Speedway in Sparta but is still in search of backing for the July 18 race at Eldora Speedway in Rossburg, Ohio.